In Pressbooks, you can choose to create ordered lists or bulleted lists. These options are available on the toolbar of your Visual Editor. 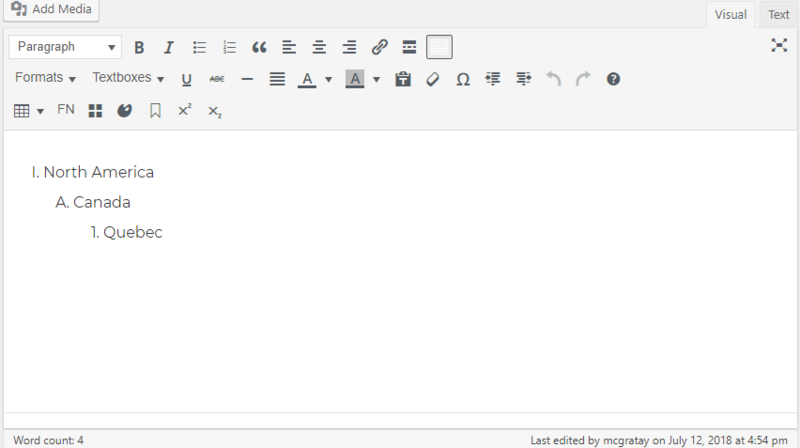 However, you can change this setting from the default in the text editor of your chapter. 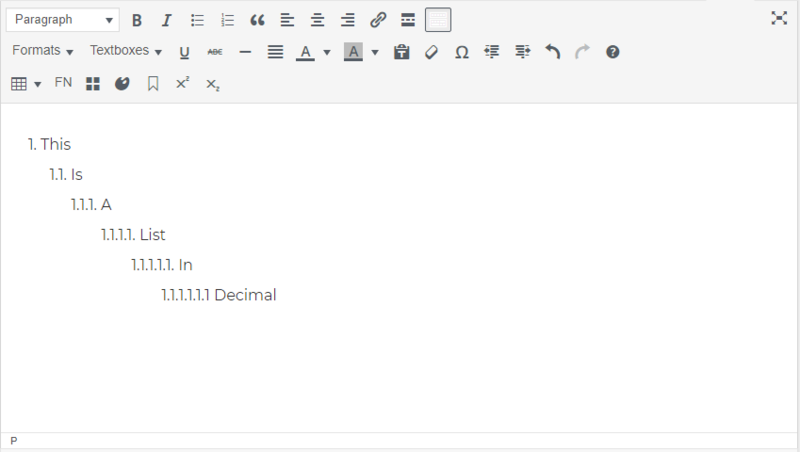 If you’re on one of Pressbooks’ most recently updated themes – Clarke, Asimov, Jacobs, or McLuhan – you can change a default numbered list to Harvard, Decimal, or Legal formatted lists. We’re in the process of updating all Pressbooks themes. After this is complete, all themes will be able to create structured lists using the classes from above. However, older themes currently still need to apply a list style manually to each newly indented tier in the list. All themes have upper alpha (A, B, C), lower alpha (a, b, c), upper roman (I, II, III), and lower roman (i, ii, iii) characters built into the CSS. You can apply these styles by editing the list in the text editor of your chapter. You can watch for theme updates (and other updates) in our Pressbooks blog! Formatting Ordered Lists by admin is licensed under a Creative Commons Attribution 4.0 International License, except where otherwise noted.